I need a PDF of this so i can print it out and tape it to my apartment building. Apparently my neighbor does not believe little dog's poop can be seen or stepped in on the walkway. 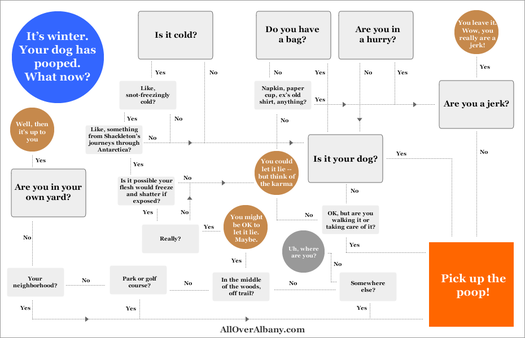 I think all of us dog owners, from time to time, have found ourselves without a bag or a good solution (Valerae's situation above being something that just sometimes happens, best laid plans or no). It happens. I get that. But the amount of dog poop on part of Washington Park near State/Willett St. right now is downright unacceptable. It's the worst I've ever seen it. Not only does it make the rest of us look bad (those of us who, for the most part, pick up after our dogs), but for those of us who have dogs that think Poopsicles are a delicacy, it is just ONE MORE THING we have to police when out on our walks ... (ugh ... gross, I know, but I also know I'm not alone here). now if only there was a way to get the cats to stop pooping all over the place...like in my landscaping. the cat stench in the summer is horrible and nothing i have tried has worked. *With an added piece of info: small dog poop is still poop! Pick it up!